and then my bed will have a new quilt at the end of it...my bedroom is coming along quite nicely. a few more tweeks and i might be willing to show you a before and after. or rather a before and and an "in the process of being an after". thank you for the well wishes on my birthday! it was a relaxing/lazy day. and cold...we are quickly aproaching winter here in the middle of nowhere...i don't know how i feel about that, except that it does mean that the GI joe husband is getting closer to coming home...hmm what should i name him when he's no longer "GI joe husband"? i didn't think about that before...any suggestions? A beautiful quilt and a charming photo. Even though I'm not a cold weather fan, that sky is nothing short of amazing! It all makes the quilt pop all the more, like hope. Kind of like your happy reunion moving closer and closer through these dreary days. Hang in there. If you make one more pinwheel quilt without sending it to me, I'm going to scream!!! ;) I LOVE IT!!!! V!! Your pictures! Are so awesome. I love looking at them. And they keep reminding me that I'm on a quest for quilts like the ones you make for my kids. So far, a fruitless quest. Didn't your husband get a psychology degree? He could be your psychic husband. Even though the two are totally different, psychic is more fun than pyschologist. But most importantly, I thank you and your husband for serving and sacrificing for our country. He serves in foreign lands and sacrifices time away from family but you too are making a sacrifice by holding down the fort at home and trying to keep a sense of normalcy for your children as well as yourself. Here is hoping and praying the time passes quickly and your husband will be home safe and sound by your side once again. I love seeing the finished product of all of your projects. It reminds me to try and finish all of my projects that I have started and not finished. well gi joe husband will always be gi joe husband to us. HAHA. but from previous post he's been referred to as handy...so idk. Love the quilt! Thank your husband for his service to our country! How about "Ex GI joe"? Love your blog! Oh, your quilt is so beautiful. I would love that talent. I missed the birthday yesterday, so Happy Belated Birthday. I hope your day was everything it could be. I don't know about a new name. I call mine GI around here and he's home. I think it could stay the same. BEAUTIFUL QUILT!!!! 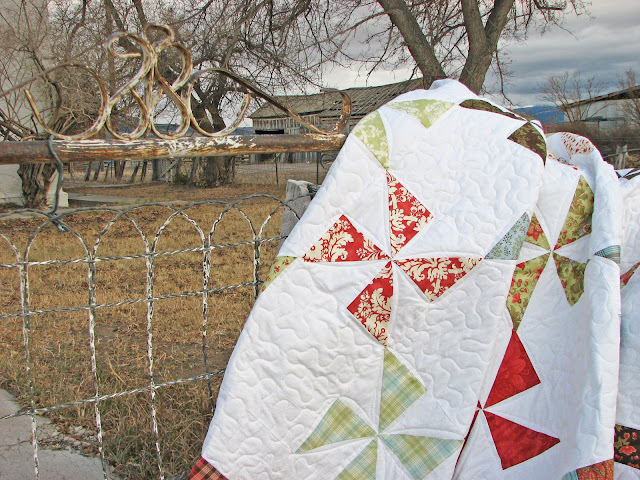 I love simple quilts like this... not a lot of fuss... very classic! Great job!!! Thinking about you today, and wanted to say "Thanks" for your sacrafices as your hubby (and you really) is serving our country! Hope all is well with you and the kids. Love ya. Such a stunning photograph! I cannot wait to see your finished room.